switching from traditional to renewable energy? “Consensus on the creation and origin of petroleum currently held by western science points to ancient microorganisms, plant matter and their subsequent burial over millions of years after which immense pressure and temperature caused by the material collecting on top of them resulted in transformation of solid, liquid and gas formations known as coal, oil and natural gas. This type of theory is referred to as biogenic or Western theory on the creation and origin of oil (Summers, 2015). Failed prediction or useful insight? Regardless of how it formed, it seems there may be quite a bit more of it than the doomsayers want there to be. Every year we read about more oil being discovered. Of course, the more of it that turns up, the less likely it gets that it could all be fossil derived. One need not bastardize language in this way. Actually hydrocarbon-based or just hydrocarbon. I don’t know if oil and gas are fossil or abiogenic, but they are surely hydrocarbons so I call them hydrocarbon fuels. Coal is very likely fossil, but I still call it a hydrocarbon fuel. Hydrogen and carbon are the actual fuels. So much of “fossil” fuel. Lets put it down as renewable energy source. Could oil become the ultimate renewable energy source, with the added benefit of fertilizing all vegetation. There’s probably both biogenic and abiogenic oil out there. Probably a lot more than we think. Look at Titan as an example. An ocean of hydrocarbons. Petroleum geologists usually rubbish the idea but the depth thing really takes some explaining. 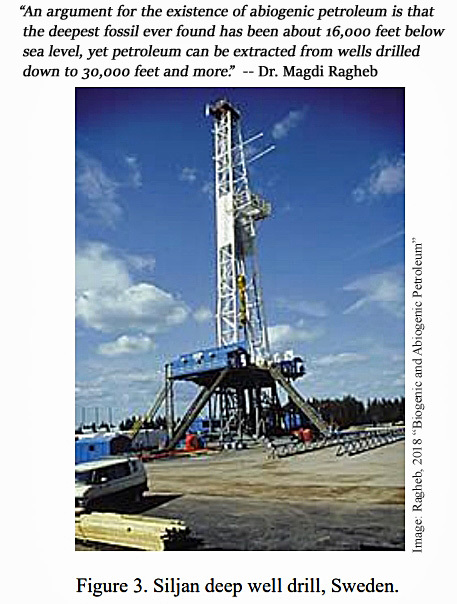 The first oil prospectors, US entrepreneurs, called it ROCK OIL. They knew exactly what it was. Russians extract oil from well below the Earth’s biogenic limit, where (biological) death matter never penetrated. Researchers have found highly complex organic molecules in deep space.